It was only in the 90s when the eyes at the bottom of an electric garage door that detect objects were mandatory, so in the years following, garage door injuries and deaths have decreased in numbers in kids. To ensure the safety of your family — especially the little ones — have your electric garage door maintenanced to avoid safety hazards. For the best in the industry, connect with A & H Garage Door Services. Now that the weather is warmer and spring is here, we’re all beginning to thaw out a little more. With better weather and sunnier days, the kids are out and about more playing in the yard and making chalk-drawings in the driveway. The kid traffic in your garage increases as they’re grabbing bikes and stored play items. The garage houses many potential safety hazards, so follow along and learn how to avoid the ER and transform your garage into a kid-safe haven. As adults, we understand the safety issues a garage can present, but steer clear of them, most of the time. We know not to drink the antifreeze and to step over the paint can, but kids often don’t have the experience or common sense yet to avoid hazardous situations. Creating a safe place for your kids may take a little extra thought and care, but it only takes a few small adjustments. If you store things like oil, antifreeze, paint thinner and paint, or bleach in your garage, it’s a good idea to inventory where they’re located. If you have them in a low area under a bench or sitting a in box off to the side, you may want to reconsider putting them in a higher place. Store them on a shelf or in a locking cabinet, out of curiosity reach for kids! Sure, obstacle courses are fun for kids, but avoid one in the garage! If you have piles of things they can climb or multiple ladders that are within reach, it may be wise to store them above the garage on the beams. Kids also love to climb on shelves, and while shelves are amazing for storage and arguably necessary, avoid free-standing shelves, as they only invite climbing. Shelves that you can secure in higher areas that they can’t climb are advisable. If your garage also doubles as a workshop, it’s extremely important to keep the power tools and other electrical gadgets unplugged and put away. Not only can kids get the cords wrapped around their necks, they’re also tiny investigators who want to know what these things do. If they have access to this equipment, it could become a safety issue very quickly. Make sure your tools are stored out of sight, so the kids don’t get curious! Because the garage door can be so fun, watching it open and close, your kids might get the idea that it’s a play object. It’s best to educate your kids and teach them that it’s not something to play with. Even though there are safety features in place, kids can still get injured. Explain not stand in the garage door way or even close to the side (fingers can get caught). 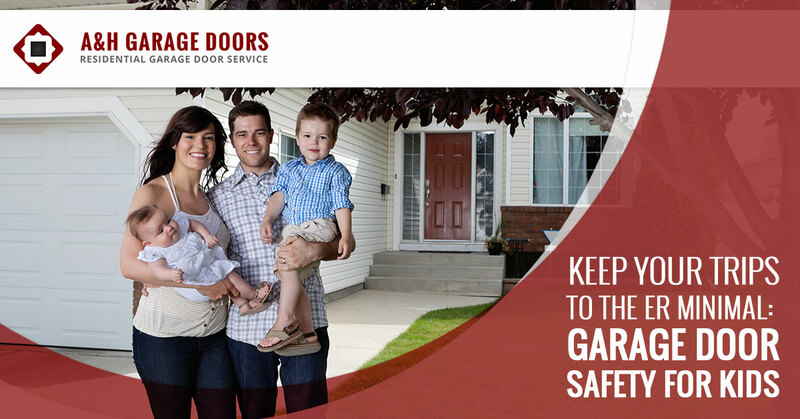 By taking precautions to avoid a dangerous garage environment such as storing hazardous materials and tools out of reach, keeping the area clean, tidy, and obstacle-free, and teaching them garage door safety, you’ll enjoy the warmer weather in a garage that’s safe for your kids. For more information about our garage door services, contact us at A & H Garage Door Services.